John Legend believes gaining success as a songwriter is as much about working hard as it is talent. With his music inspired by the classic soul and R&B music he grew up listening to, Legend says his songwriting process is “almost the exact opposite” of how most other writers work. He believes the music should drive the lyrics. He explains: “I usually start playing a melody and find the chords I like. Then I start singing something to it to see what works. Most established songwriters would agree with John Legend that hard work is the key to success. The initial spark that ignites a song idea is a gift. From then on, it’s all about putting in the hours to get it right. And it calls for an exceptional level of self-motivation and self-belief, as well as talent. The truly great songwriters just make it look easy. In reality, though, they have to put in hundreds of hours of hard work—making many mistakes along the way—in order to hone their talent and achieve their greatness. Diane Warren, one of the most successful female songwriters of all time, says she spent 20 years writing six days a week, 10-12 hours a day before she felt she could finally take the occasional weekend off! A 5-star rated book at Amazon, “How [Not] To Write A Hit Song! 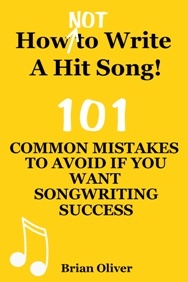 – 101 Common Mistakes To Avoid If You Want Songwriting Success” is available from Amazon as a US paperback, a UK paperback and as an eBook from Amazon’s Kindle Store. It is also available from Apple’s iTunes Book Store, Barnes & Noble’s Nook store, and KoboBooks. “How [Not] To Write Great Lyrics! – 40 Common Mistakes To Avoid When Writing Lyrics For Your Songs” is available from Amazon and Barnes & Noble as a US paperback, UK paperback and as an eBook from Amazon’s Kindle Store. It is also available from Apple’s iTunes Book Store, Barnes & Noble’s Nook store, and KoboBooks.